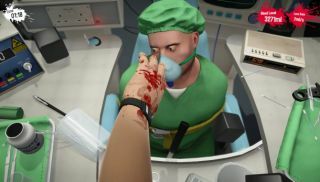 Surgeon Simulator was released on 19 April, 2013. That makes its Anniversary Edition DLC a little late, as it released last week. Still, given the uncoordinated flailing of its central protagonist, a few mistakes are to be expected. The paid-for pack enhances the game with new graphics, extra environments and two new operations. Additional environments - you'll now get to try surgery while racing down a hospital corridor. Stat tracking - shows how well you've done in your last 9 surgeries, so you can fine-tune your skills. Malpractice makes perfect, remember? As much as I enjoy the slapstick physics of Surgeon Simulator, I can think of few things less appealing than performing an eye operation, let alone a botched one. But if such malpractice piques your interest, you can grab the Anniversary Edition for £2/$3.